This Machine is part of our selectorized upper body range, used in strength training to successfully target and build the pectoral, deltoid and arm muscles in a safe, controlled and effective way. The Exigo Incline Chest Press Machine delivers a motion which imitates natural movement to guarantee comfortable exercising during the strengthening of your pectorals and deltoids. In addition this machine also helps increase upper torso stability. Selectorized machines are perfect for targeting specific muscles. This machine is a professional product ergonomically designed and manufactured in our UK factory, it features a fully adjustable seat with a comfortable back rest and 5kg incremental adjustments to offer numerous load options for a range of users. The Exigo Incline Chest Press is a must for any gym or training facility. 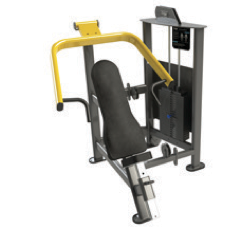 This Machine is part of our selectorized upper body range, used in strength training to successfully target and build the pectoral, deltoid and arm muscles in a safe, controlled and effective way. The Exigo Incline Chest Press Machine delivers a motion which imitates natural movement to guarantee comfortable exercising during the strengthening of your pectorals and deltoids. In addition this machine also helps increase upper torso stability. Selectorized machines are perfect for targeting specific muscles. This machine is a professional product ergonomically designed and manufactured in our UK factory, it features a fully adjustable seat with a comfortable back rest and 5kg incremental adjustments to offer numerous load options for a range of users. 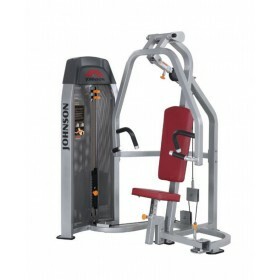 The Exigo Incline Chest Press is a must for any gym or training facility.